A Christmas tree made of tops. A nativity scene made of tops. Janell holding a traditional top. Hiroi-sensei has appeared many times in Japanese newspapers. 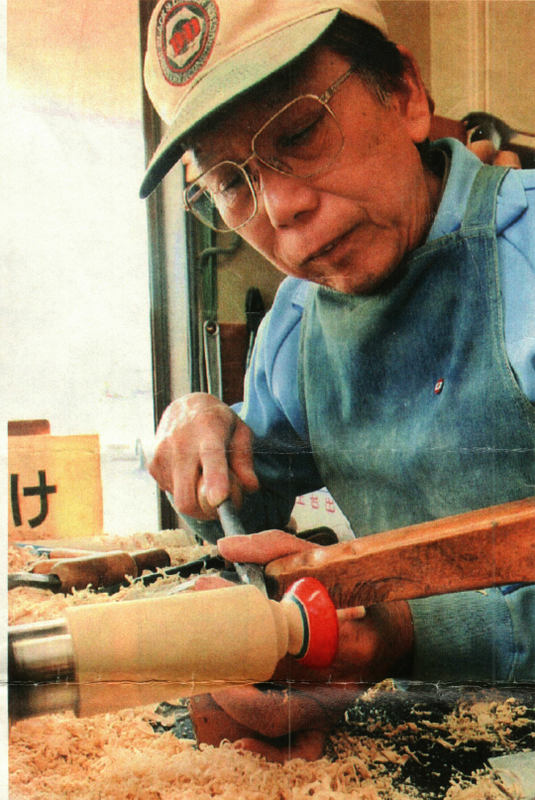 Below is a translation of an article entitled “Professionals with a Skilled Touch: Whittling – Edogoma Artisan, Hiroi Michiaki” that ran January 1, 2003 in the newspaper Kahoku shinpō. See the original Japanese article at the link below. Surely there isn’t a single person who doesn’t touch objects during the course of their job. However, there are those who notably work by cultivating years and years of experience and expertise, polishing the instincts of their fingers and hands. Are they somehow different from those of us with “normal” senses, or is their sense of touch something cultivated through their work? We look at the secrets behind three “professionals of the sense of touch”: a sushi chef, a physician, and an Edogoma (Edo top) artisan. 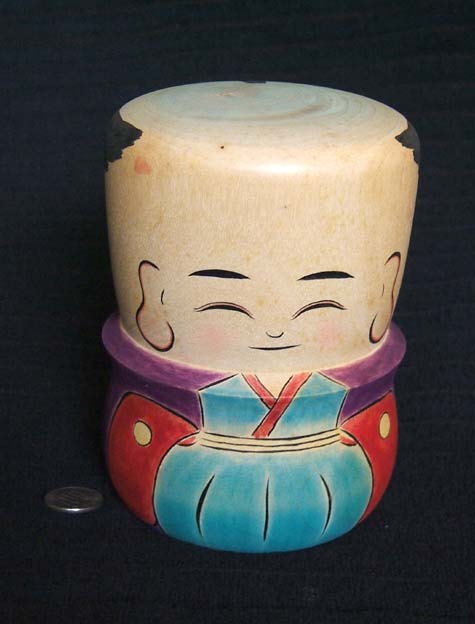 One characteristic of the brightly colored Edogoma is the sheer number of different types of tops,from simple tops to ones delightfully brimming with trick mechanisms to enjoy, like leaping tops (tobigoma) or chasing tops (oikakegoma). Only Hiroi-san and his little brother Masaaki, who lives in Tokyo, have inherited the skill of Edogoma-making. Other than them, [Hiroi-san] has two apprentices.